I know, I know. I’m not supposed to like pork. Here’s the thing–I can admit when I’m wrong. About food. I can totally admit when I’m wrong about food. This was one of those recipes that I’ve never tried before, and hadn’t really put much thought into, and didn’t exactly involve a recipe. 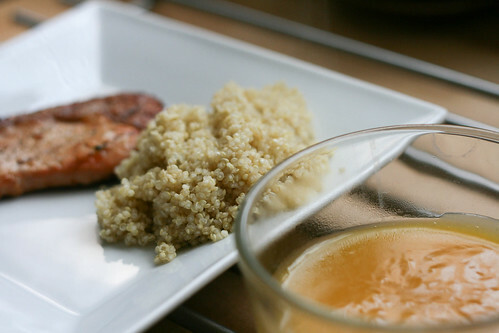 But really, how can you go wrong with freshly squeezed orange juice, soy sauce and ginger? You can’t, really. It’s pretty much a sure thing. Little of this, splash of that, shake here and there. Voila, dinner. 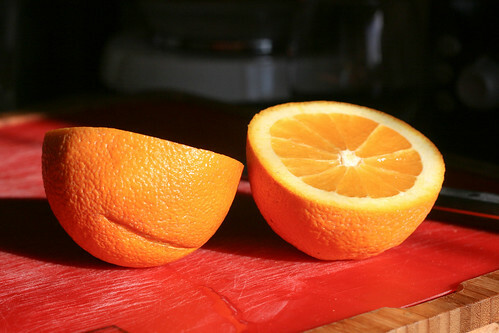 Start with some orange juice. Toss it into a bag. Add some splashes of low sodium soy sauce. Put some pork chops into the bag. Put the bag into the refrigerator. Go to work. Dream of dinner. Get home. 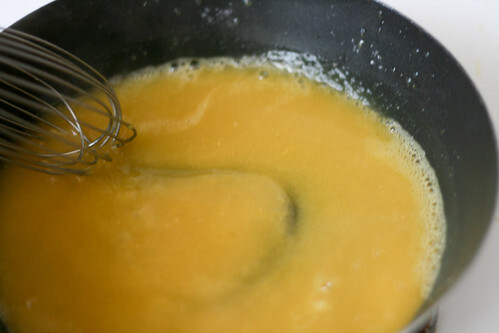 Put some more fresh orange juice into a pan. 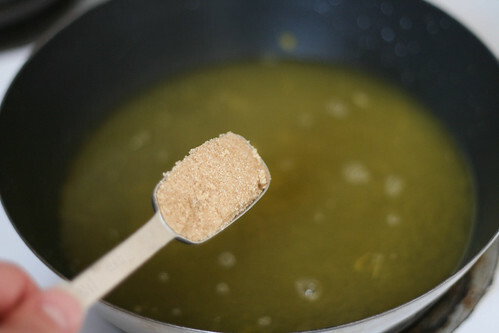 Add brown sugar. Add corn starch. 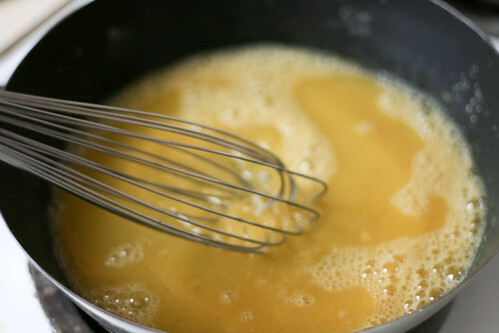 Whisk like crazy because you’re not familiar with how corn starch works. Remember that ginger would be absolutely perfect in here. Remember that you have no fresh ginger to grate on your new microplane. Remember that you have the next best thing. 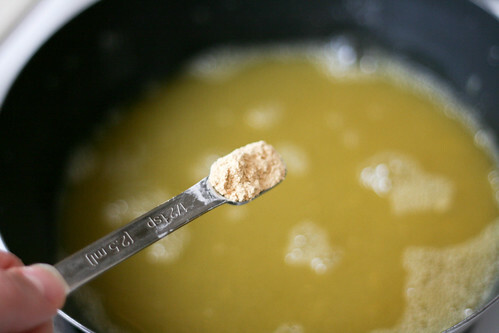 Whisk like crazy and try not to add 8 teaspoons of cornstarch to thicken it up instantly. Cornstarch takes a minute to work its magic. Get really excited when your sauce starts to visibly thicken. Pour it into a bowl and let it cool. Dip the tip of a finger into the bowl. 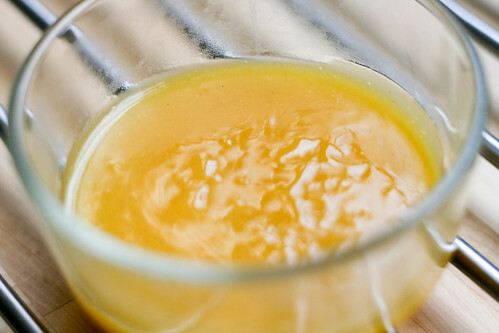 Lick the sauce off of your finger and resist the urge to go at the sauce with a spoon. Admire the sauce and wonder what else it would be good with. Steak? Pancakes? More sauce? 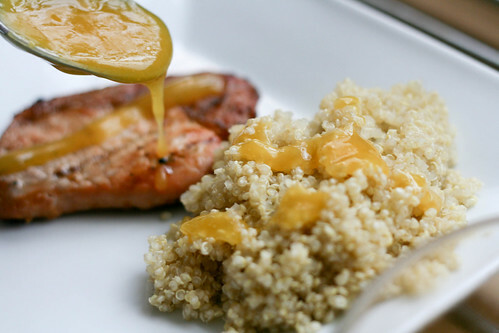 Gather your grilled pork and some quinoa or white rice. 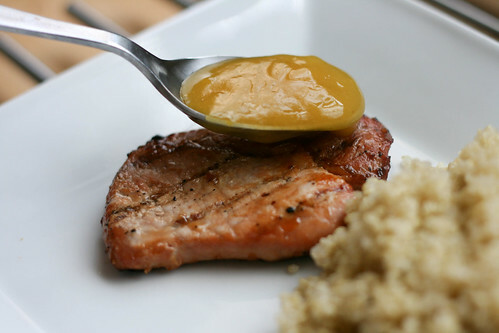 Combine the pork chops, soy sauce, and the juice of one orange in a container. 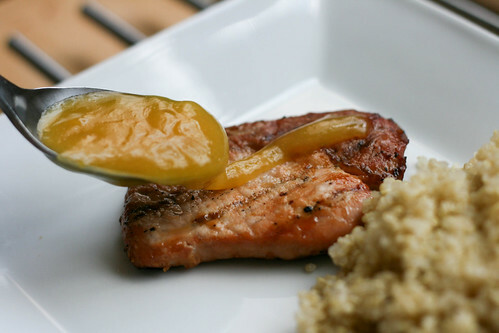 Allow the pork to marinate at least two hours (all day is best). Grill the pork, occasionally adding the leftover marinade to keep things juicy. 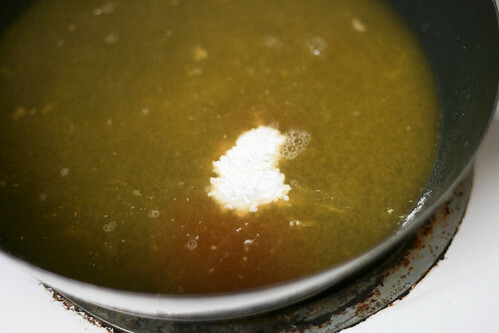 Allow the sauce to thicken, stirring regularly. 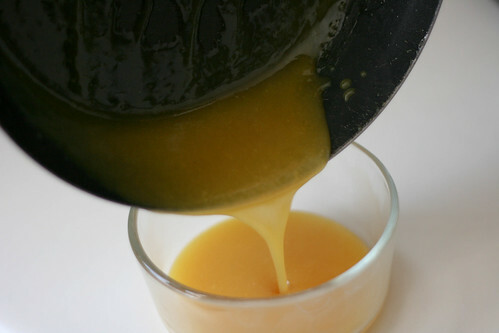 When it reaches the desired consistency, remove from heat and let it cool. When the pork is cooked completely, drizzle the sauce over it and serve. This is a great mix of sweet and savory. If you want to spice things up a bit, add some red pepper flakes to the sauce. PS: Pretty soon I’ll have progress shots of the new kitchen! w00t w00t! Jo, pork is my favorite meat (by far) and I will absolutely add this to my saucy repertoire 🙂 Great glaze, love!